The Lao government has obtained 2,221 tons of rice from the ASEAN plus Three (China, Japan, South Korea) Emergency Rice Reserve (APTERR+3) for distribution to flood victims in Attapeu province in southern Laos. 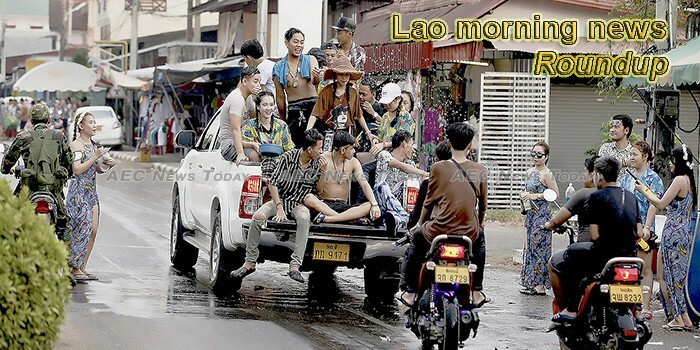 The Lao government has taken several steps to make it easier for Chinese nationals to visit Laos, such as reducing the visa fee from US$14 to US$10, said Minister of Information, Culture and Tourism, Prof. Dr Bosengkham Vongdara recently. Laos and the Australian Centre for International Agriculture Research (ACIAR) are celebrating more than 25 years of successful collaboration on agriculture research this week in Vientiane. Visiting Prime Minister Thongloun Sisoulith and his Hungarian counterpart Viktor Orban have agreed to elevate bilateral relations between Laos and Hungary to a strategic partnership. Pheuksa Garden, an affiliate to Phouvong Jewellery Shop, hosted an event to please women on the occasion of the 109th anniversary of International Women’s Day – March 8. Donny Sirisavath gives honor to his mother’s recipes at his small new noodle shop. You want to hear his story. There’s a tendency to assume a certain sameness among Southeast Asian countries—after all, the saying is “same same,” with the “but different” usually being left off. But though they’re close neighbors and are very easily paired on one excursion to the region, Cambodia and Laos, specifically the culture-rich temple havens of Cambodia‘s Siem Reap and Laos’s Luang Prabang—musts for anyone intrigued by ancient civilizations and exotic design—are quite distinctive. Get ready to enjoy, as organizers bring the heat again in Murfreesboro, as the Thai-Lao Food Fair returns to the Wat Amphawan 4880 Barfield Crescent Road. Wat Amphawan is the second Theravada Buddhist temple in Murfreesboro, established in 2009, and this fundraiser for the temple sounds like a great deal!